Do you want to rank on Google for the content you write? And don’t know how long should a blog post be to Rank On Google SERPs? Ranking a blog post with fewer words is possible or not? Do Fewer words posts get organic search? Should I write more than 300 words because SEO Yoast appears up with a green signal when I write more than 300 words? The above questions were in my minds years before, and I am sure if you are a newbie then you must be having the same questions. Years before when I started doing SEO, I was able to rank keywords with only 300 words but now the time has changed, and Google is ranking the content which is written well with more and more words (written briefly) and also the content which is grammatically perfect and easy to read. I recommend you to use Online grammar checking tools to avoid grammatical mistakes. Although, When I was not able to rank on Google with fewer words something like 300. Then I was struggling and thinking that how long should a blog post be? However, writing Long posts require some extraordinary and strong skills. Writing a long post for the newbies is little difficult, but for the regular or expert writers, it is not difficult at all. Why do long posts rank well in the Google SERPs? I am sure that you would have visited the blogs of the kings of internet marketing like Neil Patel and Brian Dean. I must say that every blogger reaches their blogs without any difficulties (just by searching on Google). And if you have visited their blogs then I am sure that you would have seen the size of their blog post. Whenever I visit their site namely Quicksprout.com, Neilpatel.com and Backlinko.com, the size of the blog post is from 3000 words to 10,000 words. 10,000 words post is approximately the biggest blog post I have read until today, and that is from these blogs only. Whereas you can see that what other bloggers write blog posts from 600 to 1200 words and some better bloggers post the words from 2000 to 3000 words. And you could easily see that Google ranks those posts which are well optimized for long written content. Even I am also getting more traffic from the blog posts which I have written with words from 1000 to 3000 words. And secondly, if you are a regular user of SEO Yoast then I am sure that you must have got an update on the content part. See the below image if you have not updated your Yoast Plugin or not knowing about it. Use of LSI keywords in the long post with long tail keywords ranks well and better. I have always used the combination of the long tail, long post, and LSI keywords together to get good ranking on Google SERPs. Images with alt tag are also a good help. You have to work in both ways. Like you have to write content which is worthy to read for your audience (actual people) and search engine friendly content too. What I mean to say is that do not write content only for search engines or your reader. Keep both in mind while writing content because Google is Using artificial intelligence programs which makes difficult to rank on Google. One of the downsides of writing a long post is sometimes it becomes hard to read, and many times readers skip reading the content. For writing a long post, you need some skills to make the readers read all content you write by making it easy to read. And also content must be unique, not copied from other websites or blogs. The content that is not well written and has no required information to the user is not at all read by the reader instead of skipping it. And for sure that these articles are not shared by the people on the social media and people might not return to your blog or website after reading your long post and which will surely result in bad user experience and no ranking at all. The best way to write a long and good readable post is to write a well-structured content and mainly easy to read. I always recommend the use of Sub-heading when writing content whether it’s long or short post. Use appropriate images wherever applicable, try not to use difficult vocabulary and avoid passive voice in your sentences. Still confused that how long should a blog post be? The recommended length of a post or an article is like more than 300 words. Although many of the bloggers are preferring to write more 1000 to 1500 words which are good for ranking. Many things depend on ranking content like perfect On-Page SEO, Competition, a number of links pointing to the website, Domain Authority, Page Authority and at the last how long and read worthy your content is. If you are a newbie, do proper research and try to write content around 700 to 800 words which will be good to read and can possibly rank on Google SERPs too by keeping the other optimization techniques in mind. Note: I will also recommend you to make the links Dofollow in the post so that Google can understand that the link in the post is passing value and the post is informative. Whereas as a Nofollow link can save you from a penalty but making all the links in the post Nofollow will not help Google to understand that your post is informative (it doesn’t matter how long your post is. I recommend you to read a complete guide on Nofollow vs. Dofollow links. Sometimes, writing good quality content is hard and difficult mainly with boring niches. But if you want to rank on Google’s First Page or be at the top then I suggest you write long posts. 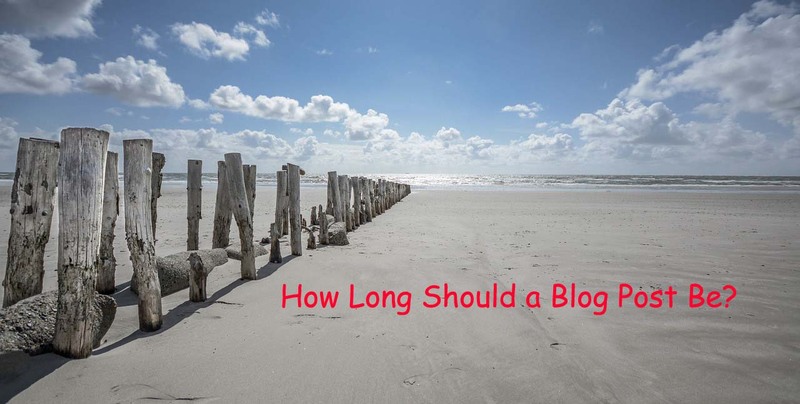 I have also provided you the examples and reasons above that how long should a blog post be. If you still have any questions or queries feel free to ask through the comments and I will be available to help you with the same. Enjoyed your reading this piece Robin. Ranking high on Google is not magical. We only have to do the right things. And one of that is making sure your blog post readability is cool and long as it has to be. When people try to say things in 1,000, when it could be said in 500 words then that’s spam. Thanks for posting. Yes, Witting unwanted and unnecessary content turn into spam. Although, thanks for sharing your feedback. It was a awesome post, many of them do blogging but they don’t follow the metric’s you have mentioned above, it is really a useful post for all the bloggers, thank you for sharing. Thanks for your Good feedback. Stay tuned for more post like this. I like the point that people could leave the long blog post even before hitting the bottom of it. Actually, here comes the blog post engagement. I always try to learn this art of readers engagement from other bloggers. This is an art that captivates and stops the reader from leaving. Hence, the more reader stays, the better. You made a good point here for newbies that choose under 800 words blog post length. Of course, once they grow in their blogging, they will ultimately increase their blog post size. In fact, in my recent article, I shared a screenshot of a well-ranked article of another blog (of mine) and the article length was 1399 words. Whereas, my articles consist of 2000+ words on average. What I believe is, bloggers should make sure that they aren’t adding fluff in the content to increase the size no matter what, whether the article ends at 700 words or crosses 2000 words. I won’t mind. The message should be delivered to the readers. In some cases length doesn’t matter, what matters I the quality and correct information that we are delivering to our audience. And also thanks the kind visit and making my post more valuable. Thanks Robin, NOw this is information to me… I was always of the opinion that crisp content of 600-700 words would be ideal as generally readers get bored of long content. shall attempt my next post at 1000 words. Let me see if I get the right mix- for my readers as well as for google rank. Welcome to my blog. I wish you luck to write good content which will be liked by your readers and as well as by search engines. The importance of length of the article is understood through this. I am Glad that i was able to help. Thanks for the Feedback. I there’s a debate going on about this. I don’t think you have to write a long post at all. Yes, yoast is a good monitor to use. But, I think what weights MORE than SEO is engagement, people commenting on your blog and getting people to know you. Excellent write-up! Length of post matters but you also write that engagement and comments also matter a lot and the other thing think that matters authority of a website. Well, if I am to be asked these days post with less than 500 words don’t fair well. And the apt word count actually depends on not just one factor. I’ve seen blog posts with over 2000 words fail. So it totally depends on other factors which include your blog’s reputation (links it has, number of articles, etc) and your competition’s power with respect to the same things. What I recommend is to neglect the word count aspect while writing. Write as much as you think is necessary to keep users interested and to convey what’s important. Don’t stress to reach a certain word count you have in mind. Interesting topic. I sometimes think my blog posts are too long (typically about 1300-1600 words), but that’s because I try to add a bit of “myself” into them. When I first started blogging I had tiny posts of about 300 words, but as I’ve become more experienced they’ve expanded. Sometimes I go back and try to prune them down. One pet peeve of mine is reading an article where people are adding unnecessary words just to get the word-count up. This makes an article uncomfortable to read. Do you know, I never even check if my posts rank – that’s because someone told me my own posts would always appear to rank if I search for the keywords myself. Can you throw any light on that please, or how to stop it? Thanks for exploring the interest topic of post length. it’s really a joy to see you here on my blog. Well checking our post is a good think because that if the post is ranking on Google SERPs is good because we can put a little more effort on those posts which are on the first page or near to first the page to get some extra organic traffic. And also thanks for the kind visit. I am personally saying that you have pointed that over 300+ word content cam makes change google ranking.It’s a strong point for content ranking.And we should need to write 300+ word article for our website, but it must be relevant content . Yes, the content must be more than 300+ words for better optimization but for better ranking, it must be 600+ words. Although. thanks for your feedback. I agree with you that most posts should aspire to be at least 1,000 words and yes the 300 words Yoast SEO recommends should be taken as a minimum.